You’ve probably heard or read that reverse mortgage closing costs are high. That’s a matter of perspective. Have you looked at closing costs on a conventional home mortgage? We’re going to compare these here to dispel this myth. As with a conventional home mortgage (known as a “forward”), the closing costs for reverse mortgages may vary depending on the home value and the complexity of the loan. Guaranteeing the lender against default or shortfalls which means the interest rates are lower (currently under 4%) compared to other mortgages. The origination fee is what the originating lender receives to cover the loan officer’s salary, overhead to run the business, i.e. staff salaries, administration costs, computers, electricity, office supplies, marketing expense, gas mileage, health insurance of employees, etc.. The origination fee also includes the processing and underwriting costs which are generally separate and charged to the borrower on forward loans. HUD regulates the reverse mortgage origination fee to be 2% of the 1st $200,000; 1% thereafter with a cap of $6,000. You also need to consider that if you do a forward mortgage now, you’ll be paying the closings costs on that loan and then when you need more funds in the future and you refinance you’ll be paying the closings costs again. These together can equal or exceed the total of the closing costs on the reverse mortgage. Whereas with the reverse mortgage you pay the closing costs upfront and then without paying closing costs again you have access to more funds through your life as long as you are living in the home as your primary residence. Often thought to be less expensive than a reverse mortgage, selling and moving is encouraged when one needs funds in retirement. My question is, if you sell where are you going to live? How long would those funds last? While selling should be considered, you need to look at the all details before thinking that it is less expensive, easier and would give you more equity from your home. Let’s look at the options. Yes, if you sell you will have up front access to more of your equity than with a reverse mortgage. Whereas you can’t access 100% of the equity at the time you are originating a loan. Closing costs for selling include 6% for the agent as well as other closing costs. On a $200,000 home sale the closing costs would be $13,400 to $14,400 depending on what the buyer would pay towards closing costs. Not to mention the costs and hassle of the move. So the costs for selling aren’t any cheaper than the reverse mortgage – in fact it would cost more to sell and move than the costs of the reverse mortgage. When selling and moving into a rental property you need to consider how long the additional funds from the sale will pay the rent. For example, if you own a home valued at $200,000 and you have a current mortgage for $100,000 that would be paid off leaving $86,600 in equity (after estimated $13,400 in closing costs). If your rent is $1,500/month, that would be 58 months or just over 4 ½ years of rent NOT including utilities, or other living expenses. If you don’t have a current mortgage, then $186,600 would be left after closing costs giving 10 years of rent payments at $1,500 per month. (Senior housing rents would more than likely be $3,000+/month shortening the length of time your funds would last for rent.) Then when you don’t have more money for rent, where are you going to live? Public Housing? As with a sale, the reverse mortgage would also pay off the current mortgage ($100,000 in this example). When selling you receive all the funds in a lump sum. With the reverse mortgage funds can be received in a lump sum, line of credit, monthly payments, or a combination of these. Funds in a line of credit grow so more funds become available over time. A growth factor is also built in if you choose to receive monthly payments. Over time with the reverse mortgage you could be accessing more than the home value was at the time of origination versus just receiving the value when you sell. Note: Depending on qualifying factors (age, home value, & expected interest rate) with the reverse mortgage additional funds may be available after paying off a current mortgage. Even if no additional funds are available after paying off a mortgage, cash flow would be improved with the reverse mortgage because there are no mortgage payments or rent payments. Unless you are investing the funds from a sale and getting significant returns on your investment, the reverse mortgage provides more funds over time and offers more options. Investments that are considered risky may not be a good option for seniors. With the reverse mortgage you will have a roof over your head without a mortgage payment or rent payment and you can stay in your home until the 150th birthday of the youngest borrower – yes, that is until you are 150 years old − as long as the home is your primary residence, you pay your taxes, insurance, maintain the property, and don’t break the terms of the loan (same for any loan agreement). If you consider the costs of property taxes, insurance and maintaining the property, cash flow is still more favorable with the reverse mortgage. Total your annual property taxes and insurance then divide by 12 months. Could you rent something for this amount? For example, if your property taxes are $2,000/a year and your annual insurance premium is $800 for a total of $2,800 or $233.33 a month, add $100 a month for maintenance totaling $333.33 a month – where can you rent something for this amount? In addition, the reverse mortgage is non-recourse which means there is no personal liability to you if the loan balance is higher than the fair market value at the time the loan is due. Now let’s consider if you are selling and purchasing and moving to a new home. With the sale you will be paying the closing costs in addition you may also pay some of the closing costs on the purchase. Unless your current home has a lot more equity than the new home, you will need to obtain a new mortgage for the difference. Would this really benefit you? Selling and moving may benefit you if you are downsizing to a townhome or condo. And if you do need a new mortgage for the difference of your sale price and the purchase price of the new home, a reverse mortgage home purchase program may be an option. We’ll discuss this in a future article – if you want this info sooner contact us if you are in Minnesota or a reverse mortgage lender in your state. If your home is larger than you can manage and has a lot of equity where you could purchase a new one without the need of a mortgage, then moving might be a good option for you to access funds. AARP often says a reverse mortgage should be a last result. And while supporting a legislation bill regarding reverse mortgages introduced in Minnesota they sent out a message for their membership to contact Governor Pawlenty to sign the bill stating, “senior homeowners deserve to be protected from financial fraud that may lead to loss of equity or even foreclosure.” They are using scare tactics and giving false information! A reverse mortgage is a mortgage that has special terms for those 62 and older to use their equity while they still own and live in the home. Income and credit aren’t considered to qualify and monthly payments are not required during the term of the loan. The loan is due when the home is no longer the primary residence of the borrower(s). When the loan is being paid off, the borrower or the estate keep any difference between the loan balance and the sale price. As a non-recourse loan, if the loan balance is higher than the sale price on the home, the lender is repaid the fair market value and the borrower doesn’t have to pay the difference. The loan documents spell out there is no personal liability to the borrower or their estate, unlike conventional mortgages that can get funds from the estate to cover the loan balance. Let’s first talk about the statement “should be a last resort.” A last resort to what? You’re having a hard time paying bills; your retirement portfolio has been cut in half; you’re having to work longer or have to go back to work; there are some things you want to do but are short funds to fulfill those dreams or needs; home repairs are needed; and taxes are due; or your struggling to put food on the table. Maybe you could use extra funds for emergencies or peace of mind. You are lacking in security, independence, dignity and control during your retirement. So when is the time to do a reverse mortgage? You wait and don’t do a reverse mortgage because AARP and others have said “the reverse mortgage should be the last resort.” Why are you struggling? Why do you do this to yourself? Why not have the peace of mind, security, independence, dignity and control that you deserve in retirement? 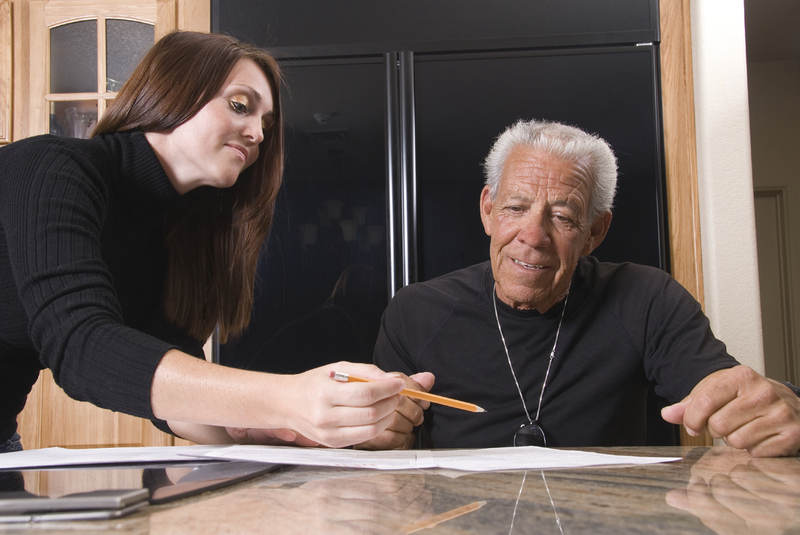 Doing the reverse mortgage now instead of later could be to your advantage. Monthly payments can be received to supplement your retirement income. Or cash flow can be improved if a current mortgage is being paid off because payments won’t need to be made. And if you chose the line of credit option, more funds become available in the future with the growth rate. If you do a “forward” loan (if you can even qualify now with the tighter qualifications) you have to pay closing costs and then you make payments. What happens when “life happens” and now you can’t make payments – you can’t work, you’re trying to decide to pay medical bills or the mortgage payments. You’re now in a crisis. Then when you decide it’s time to tap that “last resort” you’ll be paying closing costs a second time. And there is the possibility that now there won’t be enough funds from the reverse mortgage to pay off that loan. Your financial problem has gotten even bigger. And you may end up going into foreclosure. So again I ask a last resort to what? Doing the reverse mortgage sooner than later could relieve a lot of stress now and in the future. With a reverse mortgage, like any mortgage, line of credit, or other loan using an asset as collateral, one is USING the equity, NOT LOSING it. The difference with the reverse mortgage is one doesn’t have to make payments during the term of the loan but pays it off when they move, die, or sell. And because it’s non-recourse there is added protection over the other types of loans. I’m not sure how the reverse mortgage could lead to foreclosure. With the reverse mortgage one doesn’t have to make payments so that risk of foreclosure is removed. There are risks of losing the home even without the reverse mortgage: If you don’t pay taxes, the county can foreclose; if you don’t have insurance, and there is damage to the home you could be without your home. The reverse mortgage actually often helps seniors keep their home FROM FORECLOSURE. Because income and credit are not considered to qualify, the reverse mortgage can be done to pay off the current mortgage, eliminate mortgage payments and save the home from foreclosure. If AARP really cares about seniors they will stop using scare tactics and giving false information. They will get the facts by becoming educated and then help seniors by providing accurate information.